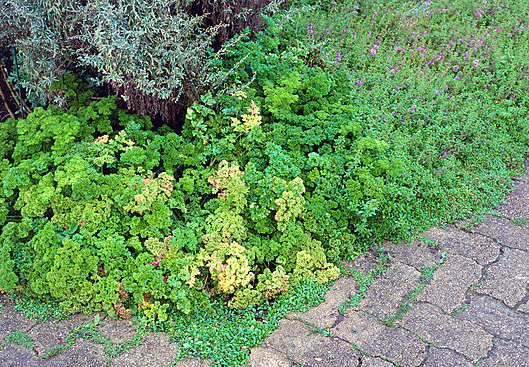 The older leaves of Parsley, Basil, Rocket and Coriander turns yellow and the growth looks stunted. Under nitrogen deficiency, the older mature leaves gradually change from their normal characteristic green appearance to a much paler green. As the deficiency progresses these older leaves become uniformly yellow (chlorotic). Leaves approach a yellowish white colour under extreme deficiency. The young leaves at the top of the plant maintain a green but paler colour and tend to become smaller in size. Branching is reduced in nitrogen deficient plants resulting in short, spindly plants. The yellowing in nitrogen deficiency is uniform over the entire leaf including the veins. As the deficiency progresses, the older leaves also show more of a tendency to wilt under mild water stress and become senescent much earlier than usual. Recovery of deficient plants to applied nitrogen is immediate (days) and spectacular. The quickest way is to apply a water soluble fertilizer as a drench (Multifeed, Nitrosol, Kelpak,Seagro). Do this weekly until the leaves are green and healthy. Also add some organic, slow release fertilizer to ensure long term availability of nitrogen. Comfrey is a virtual “superfood” for other herbs, containing not only the macronutrients nitrogen, phosphorous and potassium, but several trace nutrients as well. Add Comfrey leaves to the compost heap where it will accelerate the composting process, or use it as mulch around the base of your other herbs. Posted in Growing Herbs and tagged fertelize, Herb Gardening, nitrogen, Organic.